If you need a de-esser, you'll sssstruggle to find better than FabFilter's utterly comprehensive solution. Monitoring of removed signal. Excellent smart vocal algorithm. Low latency and oversampling modes. Works on single tracks and full mixes. Mid-side and stereo linked operation. Excellent visual display. In spite of the pro-spec virtual processing tools available to us all these days, one thing many of us still struggle to achieve is that elusive 'pro vocal'. As part of the quest, we throw huge amounts of compression at our singers, but that creates a new problem: sibilance. These harsh 'sss' sounds are an unavoidable side-effect of heavy compression, and they add a harsh edge that makes our loud vocal sound more like it was recorded in a nightclub than Abbey Road. Enter the de-esser. 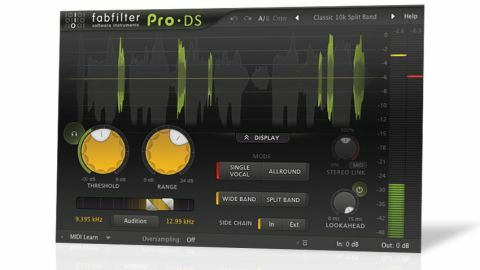 "Pro-DS is unusual in that it's designed not just for use on vocals, but any material with sharp, high-frequency content such as complete tracks or live drums"
Pro-DS (VST/VST3/AU/RTAS/AAX) is unusual in that it's designed not just for use on vocals, but any material with sharp, high-frequency content such as complete tracks or live drums. It features two distinct modes of operation: the Single Vocal mode that intelligently works out which parts of a vocal signal are sibilance, and the Allround mode that focuses on a selected sidechain range. FabFilter is, of course, quite cagey about the algorithms it employs, but you only need throw the plugin across a vocal channel or your master output and dial in some reduction to hear that they work brilliantly. A common side-effect of de-essing is the introduction of a lisping quality, but Pro-DS lets you go a long way before this starts to happen. Pro-DS has another trick up its sleeve: its choice of wide- or split-band operation. Wideband offers traditional attenuation across the selected frequency band and is, as FabFilter suggest, more natural on vocals. Split separates the upper and lower frequencies, making it ideal for taming drum loops and mastering full tracks. "Pro-DS offers more visual feedback than any de-esser we've ever used, and it's no gimmick, either"
Pro-DS offers more visual feedback than any de-esser we've ever used, and it's no gimmick, either. The main Threshold dial has a collar meter that shows the signal reduction level, while the sidechain Range also has its own meter, showing the concentration of signal and helping you zone in on the sibilance. There are master signal and gain reduction meters too, and all of that's before you even get to the whopping great waveform display that shows you how much reduction is taking place and where. Out of curiosity, we tried setting up Pro-DS on a vocal with the channel muted, just using the metering and waveform display, and the results were comparable to what we got on the same vocal using two other leading de-essers with the sound switched on. We didn't expect to run out of space writing about such a seemingly simple plugin, but we barely have room left to gush about the lookahead function, the great presets, the mid/ side functionality, oversampling, the removed signal and sidechain signal auditioning, and the low latency operation (in wideband mode). Pro-DS isn't something that everyone needs, certainly, but anybody who regularly deals with vocals and/or sampled drum loops certainly wouldn't regret investing in it.